Whether or not you actually celebrate Easter, it’s a great time to rally your folks together for some quality bonding time. And what better way to do it than with a luscious spread, bubbly for the oldies and games to entice (and hopefully wear out) the littlies? Forget Fat Tuesday, if you’ve been Good all Friday, you deserve to indulge over the weekend. From awesome desserts and hearty Italian cuisine to international spreads, here are eight different feasts for the whole family to enjoy on 21 April, minus the clean-up after. Hop on over to W Singapore for an Easter to remember with an extravagant spread of with Oysters, Gin-cured Salmon, and 40 types of cheeses at The Kitchen Table. Stops to look out for across the restaurant include their Caviar Bar, Raw Bar, and the live Foie Gras Station on top of exquisite mains along the way such as the Paella Valenciana and Seafood Gnocchetti Pasta. Don’t forget the carvery either, which will be hosting the likes of Wagyu Mayura Leg and Whole Roasted Halibut. This is an affair for the whole family: parents get to kick back for a drink while the young ones get the explore exciting activities and live out a chocolate island made just for them! The deets: available 12.30pm-4pm, includes complimentary access to the WET® Pool. Priced at $168++ per person for food only; $228++ per person with bottomless bubbly. Kids under 4 dine for free and kids aged 4-12 yrs old dine at SGD88++. 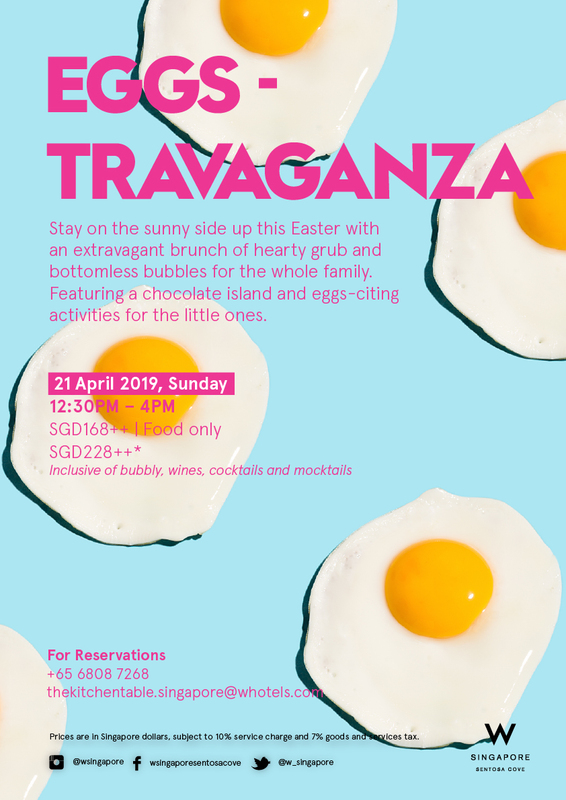 W Singapore’s Eggs-travaganza is located at The Kitchen Table, W Singapore, 21 Ocean Way, Singapore 098374, p.+65 6808 7268, e. thekitchentable.singapore@whotels.com. At Singapore Marriott Tang Plaza Hotel’s Marriott Cafe, the sumptuous Easter Sunday Lunch Buffet hosts a cornucopia of fresh seafood, charcuterie, gourmet meats and more than 80 premium dishes prepared for the whole family to go home brimming with joy and muffin tops. Expect Seared Duck Foie Gras, Lobster Thermidor, Roast Prime Rib of Beef, Leg of Ham, and more. Got a sweet tooth? Live out your wildest Willy Wonka fantasies with over 25 handcrafted varieties of whimsical, decadent desserts including a towering Orange Chocolate Fountain, Hot Cross Bun Pudding, and a Giant Chocolate Egg Tiramisu. Need a babysitter? Don’t worry, be hoppy, as fun and games galore will keep the little ones occupied while you take a well-deserved break. The deets: available 12pm-2.30pm, priced at $98++ for adults (free flow sparkling wine, wines, beer and juices) and $48++ per child. The Easter Sunday Lunch Buffet is located at Marriott Cafe, Singapore Marriott Tang Plaza Hotel, 320 Orchard Road, Singapore 238865, p.+65 6831 4605, e.+ mhrs.sindt.fb.reservations@marriotthotels.com. This Easter, LAVO Singapore is presenting an ambrosial Italian meal, garnished with magnificent views of the Singapore skyline. An exclusive chance to let the little ones join in on the usually adult-only affair, get ready for a party for all ages. Expect culinary treats like U.S. and Irish oysters, and canapés that include charred octopus with fennel and red wine vinaigrette. On top of breakfast favourites that include mixed wild mushroom frittata and applewood smoked bacon, the young ‘uns can also look-forward to face painting and Easter egg hunting, while parents sip on Veuve Clicquot champagne, Mimosas and Bloody Marys. The deets: available 12pm-3pm, priced at $158++ per adult, inclusive of free-flow alcohol, or $98++ for food only. Kids between 4 to 12 years old eat for $48++. LAVO’s Easter Brunch is located at Marina Bay Sands, 10 Bayfront Avenue, Singapore 018956, Hotel Tower 1, Level 57, p.+65 6688 8591, e.+ lavo.reservations@marinabaysands.com. The folks over at The Marmalade Pantry at Novena sure know how to celebrate Easter Sunday. With a semi buffet brunch, there’s no need to scramble around the restaurant for food. Dive into Marmalade signatures like their Mac & Cheese, Spicy Crabmeat Pasta, pancakes and truffle fries, and enjoy an extensive dessert table and fun-filled activities for the children, which include balloon sculpting, face painting and a magic show. The deets: available 12pm-2pm, The Great Easter Bonanza is priced at $50++ per adult and $28+ per child. Pay with Mastercard and guess what? The whole family (of four) gets to enjoy a complimentary family pass to the Skyline Luge Sentosa. For reservations, click here. The Great Easter Bonanza at The Marmalade Pantry at Novena is located at #01-02/04, Oasia Hotel Novena, 8 Sinaran Drive, Singapore 307470, p.+65 6664 0348. Looking to escape the city this Easter? Bust down to Sentosa’s latest restaurant, Native Kitchen for the Easter islander four-course semi-buffet and be treated to a special spread including a seafood platter with King Crab and Salmon Gravlax, a barbeque board of Grilled Chorizo and Jumbo Satay Skewers, and a paradise of desserts centred with a 6-tier Chocolate Fountain. The little ones will also get their own buffet spread. The family-friendly affair includes Easter egg hunts, a bouncy castle, face painting and balloon sculpting activities, and movie screenings for ankle-biters to work up an appetite. The deets: available from 12pm-3pm, priced at $78++ per person and $38++ per child aged 6 to 12. Top up $28++ for free-flow Prosecco, beer and wine. Families (2 Adults & 1 Child) who pay by MasterCard will also receive a complimentary Skyline Luge Sentosa Family Pass. Sentosa Islander Card members, Faber Licence Members, and KidZania Singapore Annual Pass Holders get 10% off. Reservations are highly encouraged to avoid disappointment, make them here. The Easter Islander Brunch is located at Native Kitchen, Lobby Level, 10 Artillery Avenue, Sentosa, Singapore 099951, p.+65 67220818, e. enq_nativekitchen@refineryconcepts.com. 32 floors up, have an over-easy Sunday with the family at The Westin Singapore for a delicious line-up of table mainstays, hearty roasts and prime cuts, the freshest seafood and delectable desserts at Seasonal Tastes. Dine with panoramic views of Singapore’s Marina Bay and the South China Sea through floor-to-ceiling windows, and let the kids delight in activities like Egg Painting and Easter Egg Hunts. The deets: available 12pm-3pm at $58++ per adult and $29++ per child. Marriott Bonvoy™ members enjoy exclusive dining savings of up to 20%, or one child dines free with every two paying adults. Seasonal Tastes is located at The Westin Singapore, Asia Square Tower 2, 12 Marina View, Singapore 018961, p.+ 65 6922 6968, e. seasonaltastes.singapore@westin.com. Lawry’s joins in on Easter with mouth-watering 4-course menus and good old-fashioned Easter activities. Handpicked by Executive Chef Sherwin Sim, start yourself off with Lawry’s Famous Original Spinning Bowl Salad, followed by freshly-baked bread baskets and a selection of mains like Lawry’s Signature Roasted USDA Prime Rib of Beef, or the Rosemary Crusted Lamb Rack with Truffle Oil. Then give the Easter Bunny a run for his money with Carrot Cake Shooters and Häagen-Dazs Vanilla Bean Ice Cream. The restaurant’s Fun Emporium will be hosting a variety of magic tricks, games, and even a mascot to entertain the kiddies. The deets: available 11.30am-10pm (Sundays to Thursdays) and 11.30am-10.30pm (Fridays and Saturdays) at $119++ for the four-course menu and $49++ for the Kid’s Menu. For every four sets of Easter Day set menus ordered, diners will enjoy a bottle of Dr. Loosen Riesling (750ml) on the house. Lawry’s The Prime Rib is located at Mandarin Gallery, 333A Orchard Road #04-01/31, Singapore 238897, p.+ 65 6936 3333, e. reservations@lawrys.com.sg. Working with Freedom Range Eggs in a Les Ouefs menu, highlights of Summer Hill’s Easter offerings include the Avocado & Green Chilli Persillade Eggs Benedict, Ratatouille Eggs, and Truffle-Porcini & Milk Cabbage Eggs. Enjoy the cosy neighbourhood restaurant’s other signature dishes as well, such as the Herb Crusted Dorper Lamb Ribs with Mint-pickle Zucchini, and wrap it up with Dark Chocolate Tart and Key Lime Pie for dessert. The deets: available 11.30am-3pm, priced at $80++ per person for food only and $120++ per person with free flow Prosecco and wines. Summer Hill is located at #01-62, Block 106, Clementi Street 12, Singapore 120106, p.+65 62515537. If you want to keep Easter Sunday free for family downtime, then hop on over to Zafferano Italian Restaurant & Lounge for their Easter Champagne Brunch. Digging deep into their Italian roots, the brunch buffet includes traditional Pasqua classics like Torta Pasqualina, a spinach and ricotta cheese quiche originating from Liguria, Tuscany, and roast lamb, fish, eggs, Easter pies, and sweet treats. The Easter Champagne Brunch is located at Ocean Financial Centre, Level 43, 10 Collyer Quay, Singapore 049315, p.+65 6509 1488, e. info@zafferano.sg.